For a few seasons in the mid 1960s Neil Hawke and Graham McKenzie were the spearhead of the Australian attack. The era is not one that is particularly fondly remembered today, and although Australia held the Ashes throughout Hawke’s career the side was not a vintage combination. As a bowler Hawke’s action was not a thing of beauty. A little way short of even fast medium, a distinctly crab-like approach and a strange double step in the latter stages of a run up that led to a very open chested delivery stride. By virtue of that action his stock ball swung into the right handed batsman, but he was a powerful man and despite his relatively modest pace he was most definitely a deliverer of the fabled ‘heavy’ ball. Hawke made more use than most of his type of bowling around the wicket, and he would maintain great accuracy over long spells. There was a useful leg cutter from time to time as well, although Hawke himself was never entirely sure how he produced that one. Not even his greatest admirers will pretend that Hawke was one of the great bowlers, but a haul of 91 wickets at 29.41 in 27 Tests demonstrates that he was a decent one. His batting was modest at Test level, despite some important contributions. Like his bowling his batting was not for the purists. Despite his ungainly style he was, depending on requirements capable of resolute defence or big hitting. He never did make a half century in Tests, but reached fifty eleven times at First Class level and there was one big century, an unbeaten 141 for South Australia against Queensland in 1964. Cricket was not the only sport at which Hawke excelled. In his youth he was a fine Australian Rules Footballer, a forward with a notable turn of speed. He was also a pioneer of the drop-punt style of kicking and made an auspicious interstate debut in 1963 when he helped South Australia to defeat Victoria for the first time in 37 years. 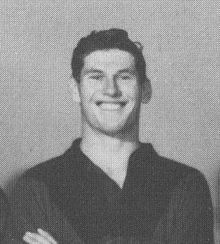 Although Adelaide born Hawke moved to Perth in 1957 in order to further his footballing ambitions, and it was for Western Australia that he made his cricketing debut against Victoria. There were no wickets, but with the bat he made 89, a score he would, with the exception of that 1964 century, never improve on. The stay in the West was relatively short however, the responsibility of a wife and child taking Hawke back to Adelaide in 1960 where, thanks to impressing Rupert Murdoch in interview, he was given the chance to spend the next couple of years learning his trade as a journalist. In his first two seasons Hawke paid more than fifty runs each for his modest haul of wickets before a major breakthrough in 1961/62 when he took 39 at 18.87, and despite a more modest performance the following season, he had still done enough to earn a Test call for the final match of the 1962/63 Ashes series. There were a couple of wickets but Hawke did not make enough of an impact to see him as part of the side for Australia’s next Test series, at home against South Africa in 1963/64. He was however the beneficiary of the controversy that saw Ian Meckiff ‘chucked out’ after the first Test and Hawke appeared in the remaining four. It was a series that most had expected Australia to win easily, although in the event it was largely down to Hawke the batsman that they managed to hold on for a 1-1 draw after he and off spinner Tom Veivers featured in a last wicket partnership of 55, and more importantly one that occupied almost an hour and a half,in the fifth Test. The partnership denied Trevor Goddard’s side time to reach their fourth innings target. Hawke had shown his durability in the fourth Test, won by South Africa by ten wickets, taking 6-139 in 39 eight ball overs. Irrespective of his less than classical action for the next couple of years Hawke was a highly effective Test match bowler. First he visited England with Bobby Simpson’s unfancied 1964 side and took 18 wickets at 27.55. In the third Test he played a major role in Australia’s win in the solitary result of the series, initially by taking 5-75 in England’s first innings, and then batting for an hour and forty minutes, during which time he scored a valuable 37 as Peter Burge played his match winning innings. In the fifth Test the 6-47 he took in England’s first innings should have paved the way for a second victory, but a much improved batting performance by the home side in their second innings put paid to that idea. This was the match where Hawke always believed his fame would come from, as he became Fred Trueman’s three hundredth Test wicket. In the half century since 27 men have passed the landmark, so it is almost commonplace, but in 1964 Trueman’s was considered a prodigious feat. After their success in England Simpson’s men visited the Caribbean, but there was to be no repeat of their Ashes success as they lost 3-1. The margin of defeat was not however in any way down to Hawke who took 24 wickets at 21.83. In the third Test he recorded his best match haul in taking 6-72 and 4-43, although his side still lost by 212 runs. In the first Test, against the backdrop of another heavy defeat, he had also hit his highest score in Tests, an unbeaten 45. Hawke was a little less successful in the 1965/66 Ashes series that followed, his 16 wickets in four Tests costing him 26.18 but he still managed to record his only seven wicket haul in the third Test. The match is rightly remembered for Bob Barber’s superb 185. It was at 303 that Hawke finally got through Barber’s defences and then gave Australia some hope by ripping out the middle order before finishing with 7-105. By then England had enough runs to win, but they could not win back the Ashes because Australia, thanks in part to Hawke’s final Test five wicket haul, won the fourth match to square the series. By now firmly established as a Test cricketer the 27 year old Hawke then made what he must have come to look back on with some regret, a comeback to the football field. He was keen to retain his fitness ahead of the 1966/67 South African tour and he was persuaded to join the West Torrens club, this time in a defensive role where he felt the risk of injury was not so great. Sadly though he was hurt, dislocating his right shoulder so badly that he needed surgery. He made a recovery that enabled him to satisfy the selectors he had regained his fitness, but the way his form deserted him at Test level made it clear that he had lost something. He took just four wickets in two outings in South Africa, and none at all in his sole appearance against the 1967/68 Indian tourists. There must have been some concern as to whether he would make the 1968 trip to England but his record from 1964, coupled with a successful Northern Hemisphere summer with Nelson in the Lancashire League in 1967 made sure he made one more Ashes trip. When Hawke arrived in England as a member of Bill Lawry’s side for what proved to be his last Test appearances and, very nearly, his final ones in First Class cricket, he was only 29. He was picked for the first Test to resume his new ball partnership with McKenzie. He felt good, bowling 15 overs at the start of the England innings on the second day. In that long spell Hawke conceded just 18 runs, and a couple of chances went down as England’s openers negotiated a tricky period to reach the close at 60-0. Next day Lawry, who Hawke liked as a man, but who he didn’t rate as a captain, did not give him even a single over as England slipped to 165 all out. It was just enough to avoid the follow on so Australia batted again, and left England to score 413 runs or bat out just over nine hours. It took Australia 102 overs to bowl them out, but despite again taking the new ball Hawke bowled just eight of them. He opened up with four overs that cost a solitary single and then languished on the boundary until England had more than 180 on the board and Bob Barber and Basil D’Oliveira were both well set. He got Barber almost straight away on his return, and then caught the edge of D’Oliveira’s bat sending the ball waist high through the slips, but the spell was no longer than the first and others got to mop up the tail. Barber’s wicket was to prove his last in Tests. The second match at Lord’s was rather different. There was rain about and only 15 hours playing time all told. Most of that was taken up by England’s first innings, in which they scored 351-7 in 144 overs before Colin Cowdrey declared. Hawke bowled 35 of the overs, all but four of them from the nursery end, uphill and against the slope. It was galling for a man who had bowled very effectively in 1964 from the pavilion end, in a game in which Lawry too was playing, to have to bowl at the ‘wrong’ end when a spinner, Johnny Gleeson, was operating from the end Hawke would have preferred. It isn’t easy to discern Lawry’s views on Hawke as a bowler, but as at one point in 1964 he had likened the task of him and McKenzie bowling at Ted Dexter and Ken Barrington that summer to ‘trying to sink battleships with popguns’ it seems unlikely he was overly impressed. Later however, after Australia’s unexpected victory, he added that despite being the ‘ugly duckling’ of Australian cricket Hawke had, over the course of the summer, become a ‘most resourceful Test bowler’. Whatever his relationship with his captain may or may not have been what could not be overlooked was the fact that in his last five Tests Hawke had taken just five wickets, and it was no surprise to the man himself that, despite a reasonable showing on the 1968 tour as a whole, his international career ended with Lord’s. During the tour Hawke, his first marriage having ended in divorce, met his second wife, Elsa. It is a matter of some regret that I have not been able to find a photograph of the lady as she was, on all the accounts I have read, stunningly attractive and, given that they spent the winter after they met apart, there was a very short courtship as the couple married in June 1969. During the winter Hawke had had discussions with Lancashire with a view to joining them as an overseas player, but he chose marriage instead, and Lancashire chose Clive Lloyd, so both parties ended up happy. Hawke’s preference, to avoid the travel that is the bugbear of the life of the county pro, was to play a second season for Nelson in the Lancashire League. Without him the club had been last but one in 1968, but they won at a canter with Hawke back. He took 112 wickets at just 7.07 to be the leading professional bowler by a very large margin, and if that weren’t enough if batting were measured by average rather than by aggregate (582 at 36.37) he was the best professional batsman as well. He was to stay in the League until 1974. His successes were never quite so spectacular again, but he was a reliable performer and in 1972 and 1973 he helped his second club, East Lancashire, to back to back titles. In addition to his duties as a professional cricketer Hawke would supplement his income by writing for a local newspaper and there was also a fashion shop in Nelson run by Elsa called ‘Eyecatcher’. The opening of the shop was done by Trueman, by now a close and valued friend of his former rival. Other good friends included the former Middlesex and England batsman Peter Parfitt, by then running a hotel in the vicinity, and journalist and Test Match Special commentator Don Mosey. Towards the end of his tenure with East Lancashire Hawke received a call from a couple of Australian businessmen offering him the opportunity to invest in two pool tables. At that time no one in England played the game, but Hawke knew that the game was popular in Australia and he decided to take a punt. He had no difficulty in persuading a couple of local hostelries in Nelson to accommodate the tables which immediately proved popular. Hawke knew that there were another twelve tables available, and when one of the breweries hosting the two originals told him they were prepared to take more he surrendered a couple of life policies, sweet talked his bank manager and managed to scrape together enough money to buy all of them. Financially it was the best decision of his life. Once the pool business took off Hawke had no time for either professional cricket or his journalism. He might have played the game as an amateur, but back problems coupled with a wrangle with the Lancashire League about who he could play for led to him turning his back on the game and concentrating on golf. He quickly got down to a handicap of two and in one summer qualified for the British Amateur Championship, although he didn’t make the cut for the final two rounds. While business was treating Hawke well his life generally was some way from perfect. He had his back problems and in 1976 he had to undergo surgery for an intestinal blockage, caused by adhesions from an appendectomy many years previously preventing him from fully digesting the peanuts that he ate with great regularity. By this time Hawke had sold his business to a company, part of the deal being a seat on the board for him. He was only just 40 but was shaken by the deaths of four of his friends and business associates, all of whom were around his own age. As many in similar situations do Hawke re-examined his priorities. He had never been particularly enamoured with the British climate and was becoming increasingly disillusioned with that by the time the 1970s drew to a close. In the past Elsa had declined to return with him to warmer climes and he had respected her wishes but this timewhen an opportunity to relocate to South Africa to try and establish pool there beckoned he decided to go, even though he must have foreseen that, as it did, any move from the UK would spell the end of the marriage. As a single man Hawke could not get a visa to enter South Africa from the UK, so he went back to Australia in order to apply from there. In the end Hawke soon met the lady who was to become his third wife, Beverley, and the South African plan was forgotten as he took the rather less stressful position of coach to Port Adelaide CC. He hoped also to be appointed secretary/manager of the football club, but he never did find out whether that job was his. On 7th June 1980 Hawke was admitted to a local hospital. He had been suffering from severe stomach pains, caused by another intestinal blockage. There was a hope that the problem would clear itself, but instead Hawke deteriorated and was rushed to the Intensive Care Unit of the Royal Adelaide Hospital. For the next three months Hawke went through crisis after crisis. He had septicaemia, gangrene and his liver and kidneys failed. He underwent more than 30 surgical procedures and on no less than twelve occasions his heart needed to be reactivated. His back became badly ulcerated and a tracheotomy meant that he could not speak. His hands were too weak to hold a pen so he could not write either. The recovery was slow and tortuous. For weeks Hawke hovered between life and death. He was so ill that on more than one occasion surgical procedures were carried out in the Intensive Care Unit itself due to fears he was not even well enough to be moved to an operating theatre. As he defied the odds again and again Hawke’s experiences convinced him that someone was looking after him, and he became a born again Christian. When Hawke did eventually start to improve the first skin grafts done to repair the enormous damage to his abdomen failed, and the procedures had to be repeated, but by 1982 he was well enough to marry Beverley, and after that the two of them took to the road. It was not quite preaching, but Hawke wanted to share his experiences with other Christians. That done he went back to his writing, working for The News, an afternoon newspaper in Adelaide, and life was, as much as it could be for him, entirely normal until 1990 when his health problems surfaced again. This time it was his liver, and although there was consideration given to a transplant the risks were felt to be too great. The legacies this time were a stroke, impaired sight and mobility and, according to Hawke in a letter to his great friend Mosey, brain damage. Although Hawke was not told his doctors believed that at this point he had four to six months to live. It is difficult to imagine that Hawke did not have an inkling of that, but neither the indomitable spirit or the sense of humour were damaged. In another letter to Mosey he wrote Satan is becoming irritated that I won’t join his team. He has promised I can bowl downwind, but I don’t believe him. Still gravely ill Hawke now had money worries. Those were partially dealt with by a gala dinner held for his benefit at the Hilton Hotel in Adelaide that was attended by 500 friends, colleagues and well wishers in August 1990. The highlight of the evening was the fact that Hawke himself was allowed a temporary leave of absence from hospital. If an emotionally charged evening helped the Hawke finances not all went quite so well. Hawke also made the always sad decision when made by a sportsman for financial reasons, to sell his memorabilia. He enlisted the assistance of a fellow writer who he knew well, and was persuaded that it would be better to ship the whole lot to England where the memorabilia market was much more developed. Hawke waited for news, but eventually was told that the memorabilia had, sadly, been lost in transit. The story took a twist then as Hawke received a request from England for a letter of authenticity in respect of one of his tour blazers, and the truth emerged that everything had been sold and Hawke’s trusted friend had kept the funds. The authorities were notified but with nothing written down, Hawke’s recollection being less than clear in places and the man concerned having relocated to England there was little that could be done. In fact however Hawke was not the only victim, and with the bizarre cockiness that some criminals seem to have Hawke’s ‘friend’ decided to return to Australia in 1993 in order to promote a book he had written. He was arrested and charged with a number of offences. The theft from Hawke was not one of them, but Hawke was paid what was due to him, leaving others with deeper pockets and more robust memories to ensure that the perpetrator was convicted and received a suspended sentence of imprisonment. Hawke made a good enough recovery from his problems in 1990 to resume work, but much to his disappointment the News went the way of many afternoon newspapers and ceased publication in 1992 bringing about an enforced retirement. For about five years after that Hawke’s health was robust enough to allow him to spend much of his time angling, and then in 1997 to be persuaded, with Beverley to enter into a short term fostering arrangement to help a young mother who was having a rough time. The arrangement worked very well, and the Hawkes were eventually appointed the child’s guardians. There were breakdowns in Hawke’s health from time to time, always serious because of his history, but each time he bounced back until finally, in October 2000, he was admitted to hospital in a critical condition. Many of his old symptoms were back and a month later he was transferred to a hospice. There was enough fight left in Hawke to confound the medical profession again by rallying sufficiently to be discharged home just before Christmas, but even Beverley was unable to provide the nursing care needed and after a few days he was back in the hospice where, on Christmas Day Hawkeye breathed his last. It isn’t easy to sum Neil Hawke up succinctly, but Yorkshiremen are generally pretty good at getting their message across using only the words that are absolutely necessary, so I will adopt Don Mosey’s description of a man of whom he was clearly extremely fond; The most courageous man I have ever known. Neil came to watch us play football for Hill’s Pharmaceuticals in the Nelson and Colne Sunday Charity League in the early 1970’s and wanted a game in goals. As I was goalkeeper I was not that chuffed – but I injured my knee and Neil stepped in. From his Aussie rules he was great at catching the crosses and kicking from his hands but h couldn’t kick a dead ballot save his life.